From August 1, 1866 to July 1, 1883 the tax on each pack with 52 cards was five cents. 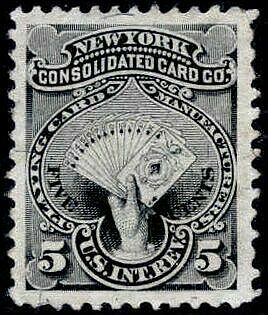 The five-cent New York Consolidated Card Company stamp was issued from sometime in 1876 through March of 1883. A total of 10,063,000 were issued on silk, pink and watermarked papers. No breakdown by type is available. This copy was printed on silk paper. This company was formed as the consolidation of Lawrence & Cohen, Samuel Hart & Company, and John J. Levy & Company in December of 1871. All of these businesses had been established by the members of the Lewis Cohen family. A check printed for use by the New York Consolidated Card Company by Clarence Levy & Henry Meigs of New York City. Research could show whether Clarence and John J. Levy were related. The check bears an RN-H4 imprint meant to pay the tax on checks in effect in some form from October 1,1862 until July 1, 1883.